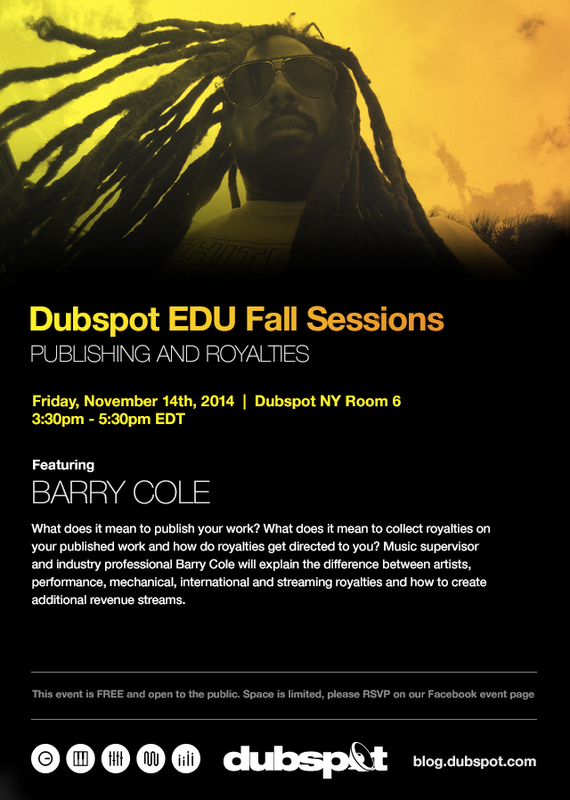 On Friday November 14th our Dubspot NY EDU Fall Sessions continue a special workshop that focuses on music publishing rights and royalties with Dubspot’s Barry Cole. For this week in our EDU event series we are focusing on two of the most important aspects of being a professional musician or recording artist: publishing and royalties. Esteemed Dubspot instructor and professional music supervisor Barry Cole will address topics such as ”what does it mean to publish your work?” and “how do royalties get directed to you?” in this worksop. He will also explain the difference between artists, performance, mechanical, international and streaming royalties and how to create additional revenue streams. Get the inside scoop on how to take your career further by knowing your rights in music publishing. This event is not to be missed! This event is FREE and open to the public. Space is limited so please arrive early and RSVP at our Facebook event page. Barry Cole is a seasoned music supervisor who has an impressive list of credits, including work on the films American Psycho, Sling Blade, Super Troopers, and Marley. Check out his IMDb page for a full list. Last year Dubspot contributor Michael Emanu investigated many aspects of this topic in three parts. Read parts one, two, and three.